You could, but here’s why you can’t. Most outdoor TV antennas today are made of aluminum. In fact, pretty much all of them are. Aluminum is a light, strong, inexpensive material that works well for years even when it’s outside. And you can’t say any of that about copper. Copper is much more conductive than aluminum so if you did have a copper antenna it would work a lot better… for about a week. Here’s what I’m talking about. Copper weighs about four times as much as aluminum. If you had a copper antenna, especially a large one, it would be heavy. You don’t want something heavy up on your roof if you can help it. Heavy things, put up high, have a tendency to make big holes when they fall. That’s just not what you want when you’re mounting something onto a roof. Heavy things also cost a lot to ship so just getting the antenna to your home would cost you a lot more. Copper is so expensive that they stopped making pennies out of it. 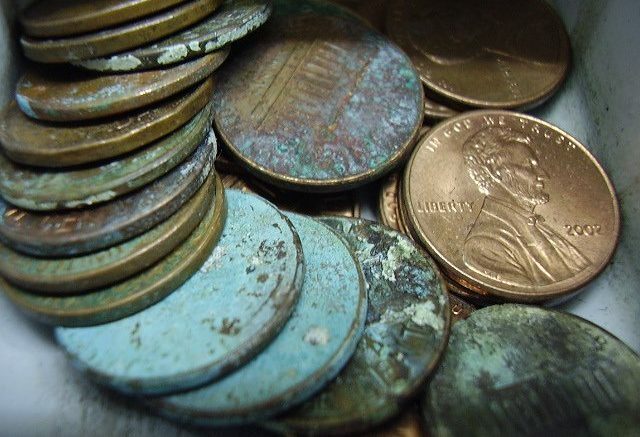 Go ahead and google it, today’s pennies have the tiniest amount of copper plating over a zinc penny. I don’t know why they even bother, then again I don’t know why they even bother with pennies. They’re a nuisance really. A copper antenna could cost four times as much as an aluminum one and no one wants that. Even if you’re searching for “The perfect antenna” there are better ways to get it than making an antenna out of copper. You could just have a larger or better designed aluminum antenna and that would work as well. One of the reasons copper is so great for wires is that it’s flexible. However, the last thing you really need is your antenna bending and buckling, which it’s going to do unless it’s much thicker than an aluminum antenna would be. Otherwise one stiff breeze would ruin the carefully constructed antenna elements. In order to make a copper antenna work you’d need a lot more copper which, as I said, makes things even heavier and even more expensive. Worst of all, copper oxidizes. Copper oxide, the green stuff you see on antennas, is really bad at picking up signals. Bare copper is really great at picking up signals, but bare copper turns dark brown then green as it oxidizes. Once it does, it’s useless for antennas or for conducting any sort of electricity really. So, a copper antenna would work well for about a week before really beginning to work poorly. That’s the real magic of aluminum. As aluminum oxidizes it forms a dense black powder that conducts electricity almost as good as bare aluminum. The powder is so dense that it stops further oxidation, meaning most of the antenna is still pure aluminum. So even years later, an antenna can work pretty much as well as it did when it was new. Copper isn’t a good choice for an outdoor antenna. Aluminum is, which is why everyone uses it. How can TV antennas be such different shapes?